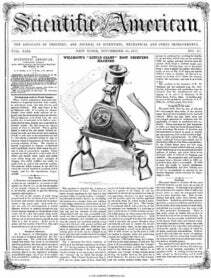 As to the growth of American iron manufactures, the Pennsylvanian says: ." Since 1848, tho consumption of that arti.streamcle in the United States has augmented in an unprecedented manner. The consumption of foreign iron, and manufactures of iron, which previous to 1848 never reached, in any one year, the value of &dollar;9,000,000, amounted in 1850 to &dollar;15,600,000; in 1856 to nearly &dollar;20,000,000. On the other hand, the domestic production of pig iron made very considerable progress. From 1852, when it amounted to 500,000 tuns, it rose to 1,000,000 tuns in 1856. The domestic manufacture of railroad iron has as yet only reached about one-half of our annual requirements. But, considering that eleven &apos;years ago we made no rails at all, this result must be regarded as exceedingly encouraging. The value of domestic manufactures of wrought iron of every description amounted in 1840 to &dollar;12,800,000; in 1850 to &dollar;22,600,000; in 1855 to &dollar;28,300,- 000."